I am one of those crazy people who dig road trips, but I was unsure whether I was going to love the one we went on yesterday to see my sister and her new baby. For one, it was a long way to drive (over two hours) for a short time to visit. We planned to stay only an hour or two, so as not to overwhelm Sis with too much company while also trying to adjust to being a new mommy. In addition, my daughter was in some sort of mood yesterday and an extended time in a car with a crabby two-year-old is not exactly a party. And also, most importantly really, I have purposely spent very little time around newborns since my miscarriage last year. I did not know if my heart would fare well in seeing my tiny niece and knowing that, right now, Teddy Graham would be about three months old. But all in all, it went well. Cupcake wanted little to do with her new cousin and was only worried that the baby might steal her cup of orange juice. She spent most of the time chasing the cat around the house, with my husband following close behind. Poor kitty. Poor Honey. And me? I was okay. My niece is small and beautiful. I held her from the moment I arrived to almost the moment we left. She stared into my eyes, wide awake, for a good while and eventually fell asleep as I rocked her gently. She didn’t say a peep the whole time we were there. And I am ashamed to admit that it wasn’t until the drive home that I even thought about Teddy. I don’t know if this makes me a horrible mom, or if it just means I am finally on my way to some sort of healing. 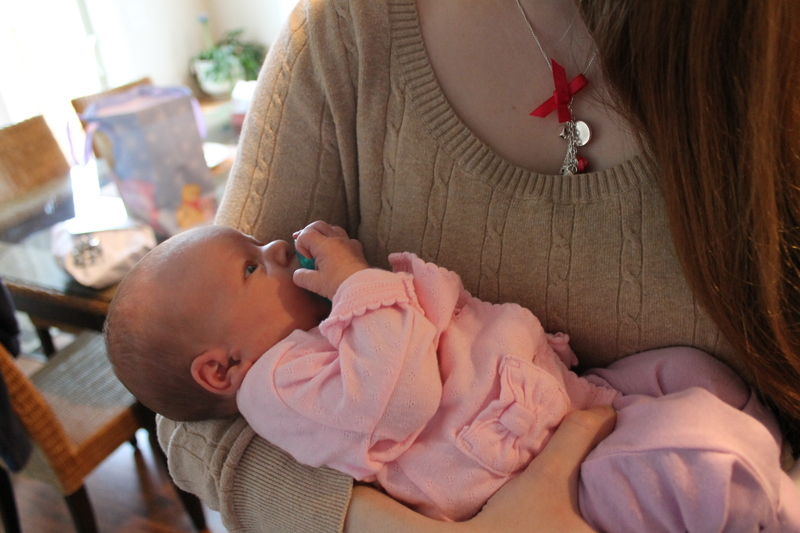 And one other thing…as I held my niece, I was surprised by how natural it felt. How right. There have been times recently when I have wondered if I would even know how to take care of a newborn again. If I would know what to do, or how to hold one, or rock one, or love one. It seems so long ago that Cupcake was that small. But I was reminded that, somehow, mothering a baby is like riding a bike. You just never forget how to do it. And I am so glad that, finally, I have something to be confident in. Beautiful photo! I’m glad the visit went well. And just because you didn’t think of teddy graham doesn’t make you any less of a mommy. We all have to heal eventually and I’m sure that’s not a pain you want to hang on to forever. He will always be in your heart and nothing will ever change that. Nothing I was going to say sounds as good as Kelly – so, what she said! Ah! I love itty bitty babies. I can’t wait to hold one. Anyone! It doesn’t need to be mine – though the fact that the next one might be my own is super exciting. Kisses for the tiny baby!! I definitely think it is a sign of healing. You’ll never forget Teddy Graham. but you should live your life not being sad all the time. Your niece is adorable. It is amazing how small she is. I can’t wait to hold my own soon. If you think you know me personally and I have not given you permission to read this blog, I ask that you please respect my privacy and stop reading immediately. Thank you. I can be contacted at cassie.s.dash@gmail.com. Interested in following my journey? Enter your e-mail address here for updates. Kicking Infertility in the A!